We are honored to be considered a top trip for 2016 according to the knowledgeable folks at Backpacker Magazine. 1. Flexibility – if the weather is bad, just move your basecamp. 2. Comfort – You can stand up while cooking indoors. 3. Efficiency – Hike all day then drive to a new trailhead and do it again. “Renting a Volkswagen bus made us part of a gang of our own. Fellow vanagons would give us “Westy Wave,” and when we pulled into a gas station we were instant superstars. I’m going to miss hanging out in the right lane and so many of the other fun times we had with Frankie, the name we christened our Vanagon. 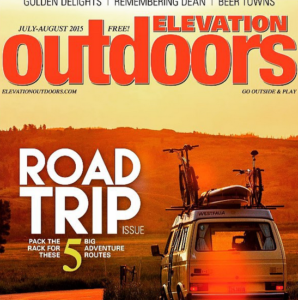 And wherever he is, I know his current passengers are enjoying their own destiny.” – Joe Risi, Elevation Outdoors. 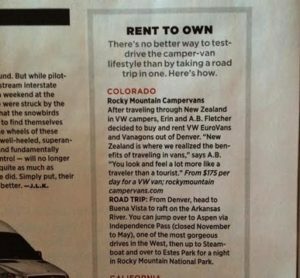 ROCKY MOUNTAIN CAMPERVANS IN MEN’S JOURNAL MAGAZINE! 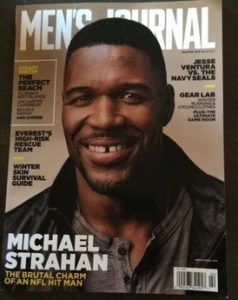 Thank you Men’s Journal for including us in an article on camper van camping. It is a great article in the January-February 2015 edition that anyone interested in renting a van should check out.